This was originally posted at my old blog in 2009. My friend Jehanna helped by answering a lot of my questions. She's got tons more experience than I do making jellies, since the only one I've ever made before was Hillbilly Housewife's Grape Jelly, which is a really easy recipe, but has a lot of sugar, most jelly recipes call for a ton of sugar with the pectin. So my criteria was a small batch, ingredients easy to get year round inexpensively, not so much sugar, and nicely gelled. After talking to my friend, I realized a freezer jam, since it doesn't need to be shelf stable, also doesn't need pectin as the gelling agent. So I used Knox gelatin. Agar would work as well if you are a vegan, but I couldn't find my agar, and I always have gelatin on hand because I'd rather my children have fruit juice than Jell-O. Gelatin also has the advantage it COSTS a lot less than pectin. Spoon to stir with. I used one of my wooden spoons. About jars- I used an empty spaghetti sauce jar because my family will go through a lot of jelly in a week. 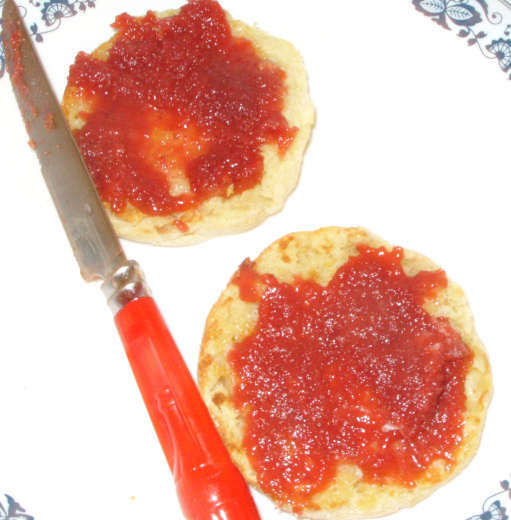 If you don't use a lot of jelly, use smaller jars and keep some in the freezer that can be thawed as needed. 2 envelopes of gelatin. One if you like a soft set. Put the strawberries in the pan, and sprinkle the sugar over them, then leave it alone while the strawberries thaw. I just did something else for a couple hours. After the strawberries are thawed, blend them to mush with the stick blender, and put them on medium heat on your stove top. Bloom packets of gelatin in cold water. Bring the strawberries up to a nice simmer, stirring constantly so they don't burn. When they are bubbly, turn off the heat, and stir in the water/gelatin mix. If you want to hit it again with your stick blender to make sure it's well blended, you can. Pour mixture into empty jar and cap. Let it set until room temperature then chill. After a few hours, it's set. Give it a good stir, and serve. Keep refrigerated. Because this is low sugar, it's not as sweet as commercial jellies, it's a bit tart, and tastes like strawberries, more a fruit spread than jelly as you are used to from the supermarket. Because this is set with gelatin, it actually works with a lot of types of berries. It's a healthier option than the high sugar jams that are available in stores and my family loves it. However, it doesn't make a good gift like traditionally made jams do because it's not hot processed into jars to be shelf stable. *Which is one of those handheld blender things, you don't *really* need one, but I like them. You could blend your strawberries in a regular blender or break them up with forks.